Is Costco giving out free $150 coupons to families to celebrate its 50th Anniversary? 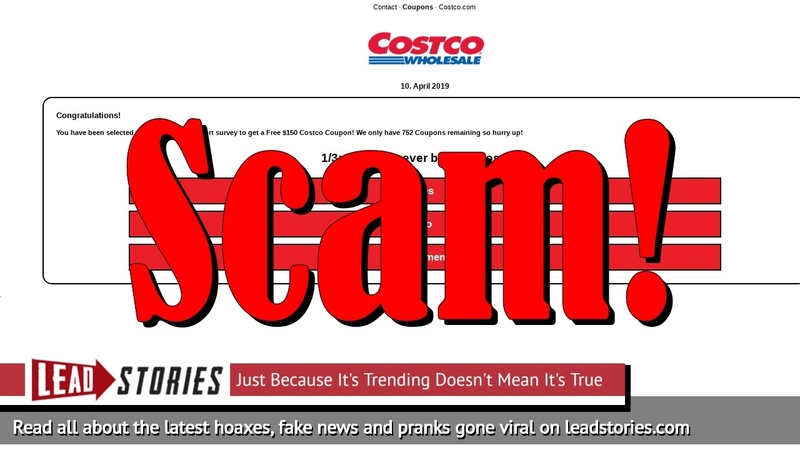 No, that's not true: a scam website is luring visitors by promising Costco coupons in exchange for completing surveys but the whole thing is a scam designed to steal personal information. The setup is similar to earlier scams targeting different brands before. Costco was founded (as Price Club) in July 1976, making it 42 years old. It only became Costco in September of 1983, 35 years ago. You have been selected to take part in our short survey to get a Free $150 Costco Coupon! We only have 752 Coupons remaining so hurry up! The scammers behind the site regularily launch new sites targeting different brands and businesses but they all look similar. Earlier versions we spotted were aimed at Little Caesars, Dunkin' Donuts, JetBlue, Delta and Alaska Airlines.